This expression comes from the idea that when a person has a difficult time grooming their hair in the morning, the rest of their day is also difficult to manage. This expression is used to describe something in a humorous or funny way. Yesterday, my mom was having a bad hair day so I decided to show her my report card this evening. Sarah's crying because she's having a bad hair day. First, she forgot about the manager's meeting and second, she had prepared the report for the wrong client. Avoid the boss if you can. He's having yet another bad hair day and is taking his frustrations out on everyone. I'm having a real bad hair day. When I got in the car I noticed I was wearing my pajama bottoms and I had to run back into my house and change into my work pants. As a result, I was 20 minutes late. I feel so stupid wearing a baseball cap with my skirts and dresses in the morning as I go to work but I don't want to have another bad hair day. The humidity turns my hair into a curly, frizzy mess. I just throw my hair up in a ponytail every time I have a bad hair day. Is she having another bad hair day? Ha, ha, yes, maybe we should get her a gift certificate to the hair salon. Sorry I can't go out—I’m having a bad hair day so I’ve decided to just stay home and rest tonight. Whenever I'm having a bad hair day I just throw on a baseball cap and get going anyhow. He's having a bad hair day despite the fact that he's bald. 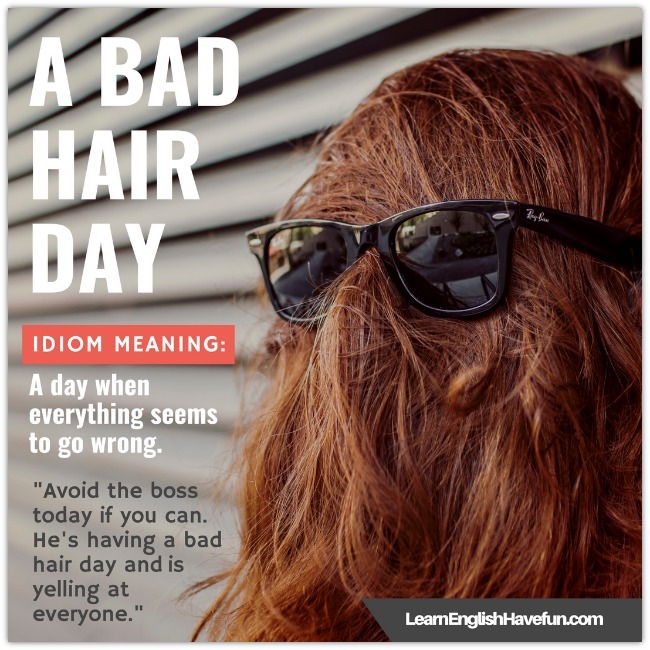 Your turn to use the idiom "bad hair day"